Same Stems: Sporing March to June. Erect to prostrate, here a bit of both. Often sinuous, but not these specimens, of which there are more than 12 or so, some branching from the same origin. 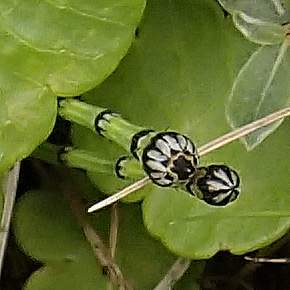 The stems reach 40 cm but are often less than 20cm long. Rarely they can reach 40cm. 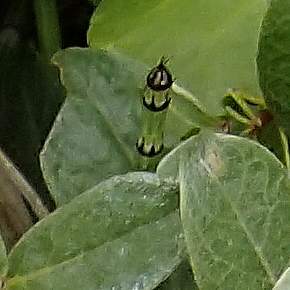 Sometimes Variegated Horsetail branches from the bases, as it does here. 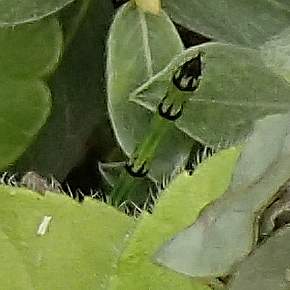 The ridges on the stem are 2-angled. It is usually rough to the touch. The cones have a blunt pinnacle at the top, much like the shorter spike atop Rough Horsetail. Growing amongst and beneath Marsh Pennywort and other growth in a damp dune slack. 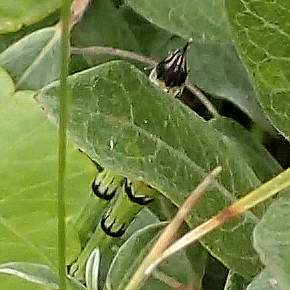 Your Author took only one photo looking down (of the Marsh Pennywort) not noticing all the Variegated Horsetail that was sprawling about - but he would not have recognised it in 2015 for what it was. Hence the thumbnails. 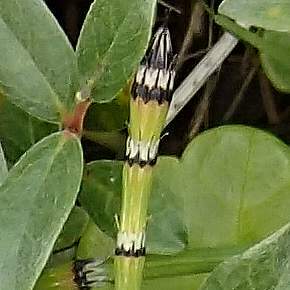 The stems of variegated Horsetail are between 2 and 3mm thick. They have narrow dark sheaths with white teeth. The cones have a blunt pinnacle at the top, much like the shorter spike atop Rough Horsetail. all these fertile heads are not yet sporing. 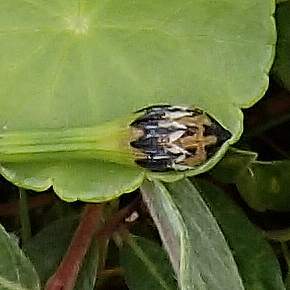 The teeth peel back away from the stem. 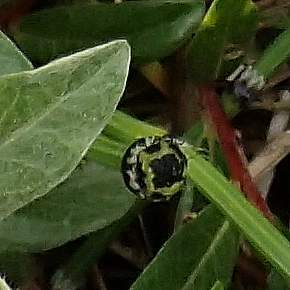 The stem has between 4 to 10 ridges which are two-angled. There are not two sorts separated into fertile and infertile, but only one - whereby the fertile heads are on normal vegetative shoots. It is native and grows in damp places. Places such as dune-slacks, lake shores, riverbanks, mountain sites in stony areas or mountain flushes and on limy soils. 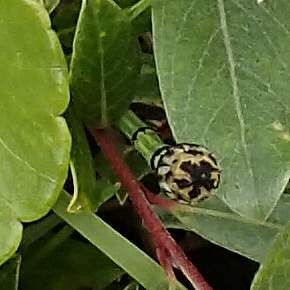 It is fairly rare, found scattered in Ireland and the west and north of Britain, but very rare in the Central and the South of England.